As proud proud pitmasters we can’t sit idly by and risk letting a whole turkey get dried out and ruined in the oven when we have a smoker sitting right outside. The smoker is our domain, where we are king, and where a turkey belongs. But if you’ve never smoked a whole turkey the experience can seem overwhelming. You don’t have to worry about ruining Thanksgiving though. By following these tips for smoking a whole turkey you’re guests will be begging you for your secret recipe. 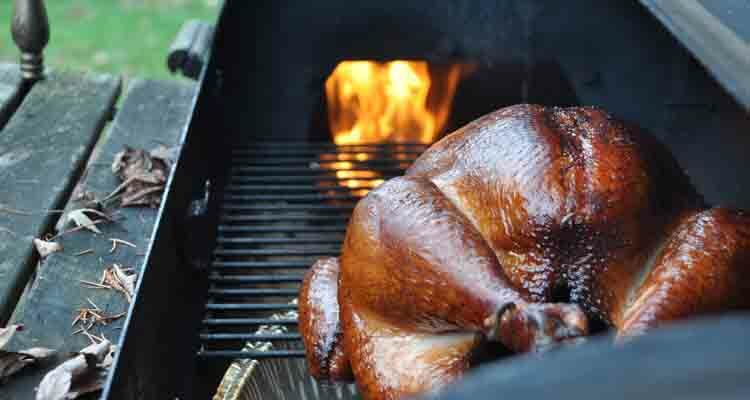 Using your smoker to cook the turkey comes with a few hidden benefits besides delivering a beautiful end product. If you have a smaller kitchen you will know how hot it gets in there with the oven on for the entire day. Cooking the turkey outside will keep your kitchen from becoming a sauna. You’ll also free up the oven to be used for any other side dishes. As well as dividing up the work and cutting down stress for everyone. So ditch the oven, fire up the smoker and lets get started. 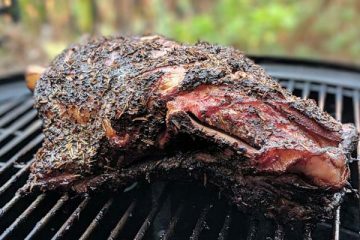 While smoking a turkey is no different than any other piece of meat, there are a few aspects of added difficulty that can stump even the most veteran smoking enthusiast. 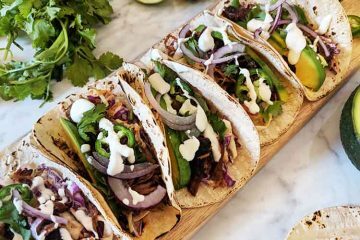 Turkey is a very delicate meat that doesn’t have a lot of connective tissue or fat, it will dry out and darken quickly as well as absorb the flavours of smoke much more easily than other meat products will. As such, smoking a turkey requires a sort of “gentle touch”. But fear not, that is what we are here for. So lets start with the different smokers. Before you even start thinking about preparing your bird, it’s time to do a quick stocktake. If you smoke often then none of this should be new to you. Obviously the main piece of equipment you’ll need to worry about is the smoker. You need to make sure you have a large enough smoker for the size of the bird you plan on cooking. There are so many different types of smokers it’s hard to cover them all so we suggest doing a quick Google search for “smoking a whole turkey” + your smokers name. As a rule of thumb a 18″ or 22″ Weber Smokey Mountain will easily fit a whole turkey. You should also be more than safe smoking a turkey in a Bradley or Traeger. The main thing you need to ensure is that there is ample space above and around the turkey to allow for air flow. We would start off with a smaller turkey no larger than 13 pounds (unstuffed). 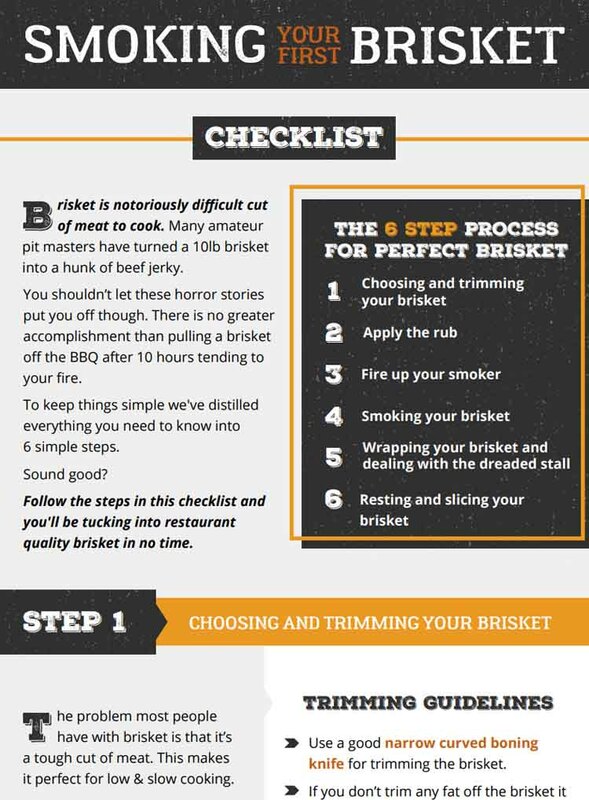 Don’t worry if you haven’t already bought a smoker. We have a comprehensive guide to the best smokers for beginners all under $500. Again this is should be common knowledge if you’ve smoked before. 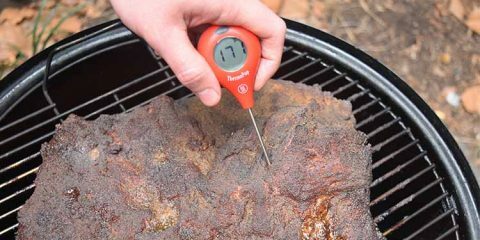 Don’t rely on the built in thermometer on your smoker (it lies to you), or guess work, just invest in a proper dual probe thermometer so you can measure the internal temp of the bird, while ensuring your smoker stays at the ideal temperature. We recommend the ThermoPro TP08 or the Maverick ET-733 if you can spare a little extra cash. If you’ve always just gone to the store and grabbed a bag of charcoal briquettes then we recommend giving lump charcoal a try. 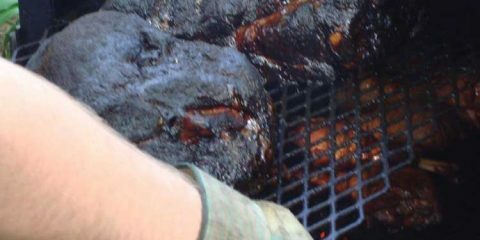 You’ll be impressed by the difference cooking with lump charcoal can have. Stop fussing around with charcoal lighters and just get yourself a chimney starter. Everything else you should be able to source from your kitchen. If you’re not sure check out our list of the 6 smoking accessories that will make your life a heck of a lot easier. Now that you’ve got all the gear you need to smoke the turkey let’s find out how to actually get it ready. There are a lot of ways to prepare your turkey, each has their own positives and negatives and they all add a different layer of flavour. Please remember that you’re cooking poultry and as such, must thoroughly wash the bird and anything that comes into contact with it. wear gloves at all times when handling it. Cleanliness is key. To spatchcock a bird, you take a pair of butcher shears and cut along the spine, removing it and the breastbone. Which will allow you to lay the bird flat. Mark Bittman goes through how to properly spatchcock a Turkey in this video below. This technique can be used in conjunction with any other method of preparation, and it means the bird will cook faster because it is thinner, absorb more smoke because of the greater surface area and allow for any rub or flavouring you use to cover the bird more completely. The downside is you can’t stuff the bird and there is a much greater potential for it to dry out if you’re not being attentive. If you’re a purist, and especially if you’re using a wood smoker, this may actually be the best choice for you. Some people just want to taste the turkey, no fancy rubs or spices ruining their hard work. The butter or juices from the turkey will help to add a golden brown skin and keep things moist, it won’t do much for flavour. 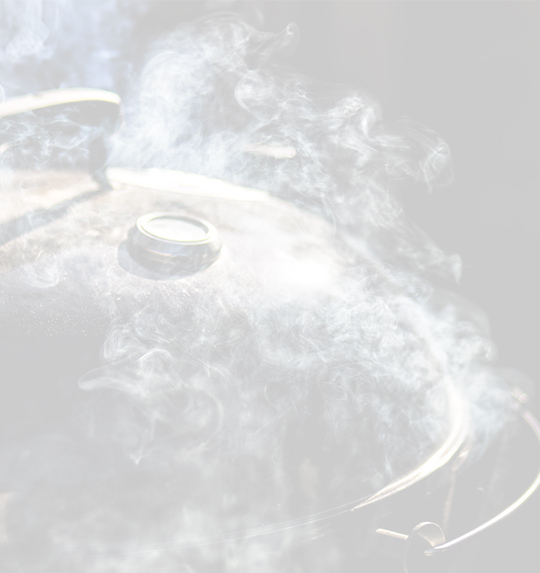 If you’re using a smoker the inherent nature of the cooking method will add a smokey taste, which for many, is all you need. Though we recommend you do add a bit of salt and pepper beforehand. There are more spice rubs out there than their are stars in the sky. 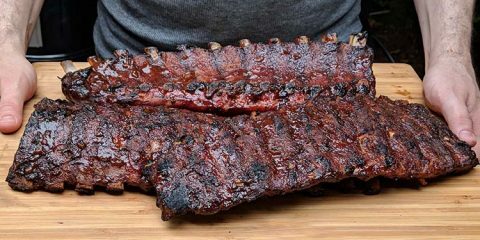 Check out our guide to the best store bought rubs (you can order them all online if you’re in a hurry) or just make your own. Just remember that turkey is a relatively flavourless meat and that you want to coat it as thoroughly as possible. A spice rub will also add a great texture to the skin and help to “catch” the smoke you use to cook it. Mix all your ingredients together to form a paste that will better stick to the turkey, then either using a gloved hand or basting brush, cover the the outside of the turkey. Don’t be shy here. Brining helps to tenderise the meat and keep your bird moist all at the same time. It does require the most preparation though. The night before you’re ready to cook, submerge your bird (breast down) in the brine. If your bird is especially large or small (but remember it shouldn’t really be above 13 pounds), you can adjust the recipe, but keep the water to salt ratio at a 1-1. Take all these ingredients and put them in a clean pot or container, place your turkey inside and let sit in your fridge for the evening before cooking. Afterwards you can dry your turkey and add some rub to the skin if desired. Or just cook it as is. No matter which exact method or temperature you cook at, your bird must reach an internal temperature of 165°F at its thickest point. Keep your smoker between 225 – 250°F, but if it dips higher or lower its not a huge deal. Just make sure it doesn’t stay that way for too long. At this temperature it may take as long as 45 minutes to and hour per pound. Plus about 45 minutes in the oven to crisp up the skin. This method is good for keeping your turkey moist and delicious, though you may need to finish it in the oven to get a good skin colour. Now that we’ve covered all the basics you’re almost ready to start smoking. Before you go we’ve put together some helpful tips to help with your first time. Follow these 10 tips and and you’re turkey is sure to be a hit with friends and family. 1 – Use a digital thermometer – We know, we know, we already mentioned this. 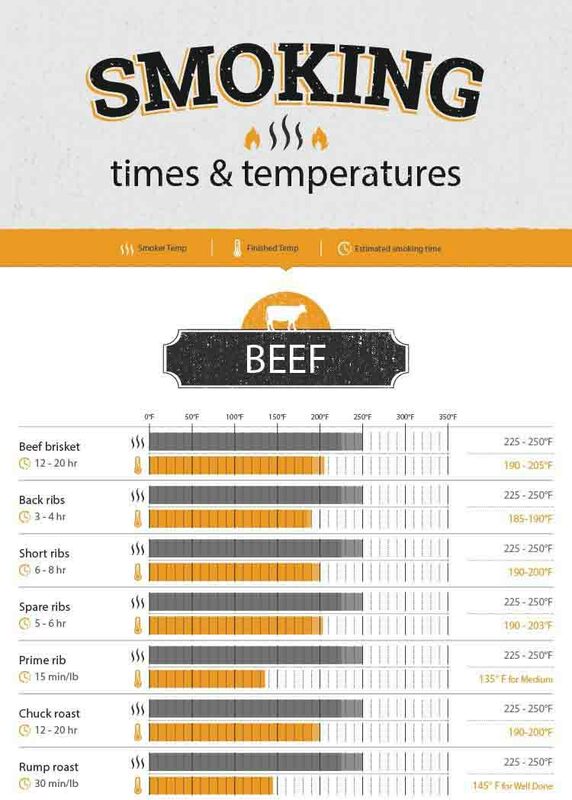 But if you’re not already using a proper thermometer this is the best thing you can do to improve as a pitmaster. A proper smoking thermometer will read more quickly and accurately than a traditional “dial” one or those “turkey poppers” your butcher gives you. If you don’t know which thermometer to use, check out our guide. 2 – Fresh, not frozen – Skip the freezer isle of your grocery store and head to a butcher. He or she can help you decide on size and the end product will be so much more flavourful and juicy. Plus no defrost time. 3 – Put a drip pan under your bird – this will catch the drippings for gravy. Which is a staple of Thanksgiving and should not be skipped over. 4 – Don’t stuff your bird – You can if you really want, but making oven stuffing and adding some of the turkey drippings will be just as delicious. Plus it will save you on overall cooking time. 6 – Let it rest – It’s best to let your turkey sit for about 30 minutes after cooking. So when carving the juices stay in the meat, and not all over the table. 7 – Don’t always check it – we know you’re proud and want to show off. But let the turkey be, or it will never finish cooking. Again having a dual probe thermometer setup will save your bacon here. 8 – Beware of Mother Nature – if it’s cold outside try and put your smoker somewhere with no wind. Or you will have a tough time keeping your temperature consistent. 9 – Handle safely – this is raw poultry so wear gloves and wash the bird before you do anything with it. Don’t let it sit on your counter, or let the juices fly everywhere. 10 – Have fun! – We smoke meats because we love it, take pride in your work but remember this isn’t a competition. Have a beer, spend time with family, laugh it up, enjoy the holiday. It’s okay if not everything is perfect.